Happy Monday everybody! We are in the home stretch. Just a few days left until Christmas. In our house that means busy, busy, busy! With two girls in Choir and one of them on the ski team there isn't a whole lot of down time. This week and weekend were certainly no exception. The middle of last week meant a holiday concert for Miss K at the Immaculate Conception Church with both the choir and orchestra. I wish I had photos to share, but the place was so full you could barely see let alone photograph a random performer let alone your own child. We moved the high school performance to the church because we had out grown our own theater, it may be time to find a larger hall. Then Saturday, Miss K officially tried out for the ski team and later helped out in the kitchens with a cinnamon roll fundraiser. She began her day at 7am and didn't end until 2 in the morning. Thank goodness she chose to not do Much Ado About Nothing too. She would have had to cloned herself! They were performing to sold out crowds all weekend. Back to Miss H...I do have pictures of her performances on Saturday (yes, we needed to clone ourselves too). Miss H and her choir are part of a Christmas Community Service Project here in town. 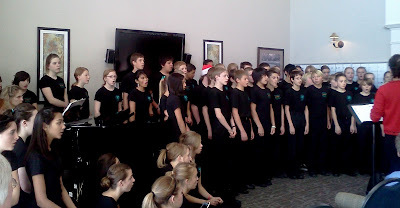 As part of that they performed for two retirement homes and the 7th Adventist Church all here in Northwest Reno. We are so lucky to have such wonderful audiences and even luckier that the places we perform have such amazing acoustics. After dropping Miss K off for the bus to take her to the ski mountain with nothing more than a hug and a good luck, we both hopped on the school buses with 150 or so 7th and 8th graders. Our first stop was a very popular active style retirement home. Not only did our kids fill the stairway, they were also surrounding this room up above on a wrap around balcony. The sounds reverberated through the entire space. I spied an audience member or two turning down their hearing aids. It created a very powerful sound. Next, we climbed a very precarious hillside in our buses to perform at the church. We have a huge Mormon faith population in Northern Nevada, but Northwest Reno seems to be where a great majority choose to call home. I can't say I blame them. Their churches are gorgeous, their temple takes center stage in our community and our schools are quite good. Part of the reason our schools are so good is because they their support of our youth and their well rounded educational experience. I work side by side with many a Mormon mom, dad, and teacher. Although our faiths are not exactly the same, we are each here with the same purpose. I love it! 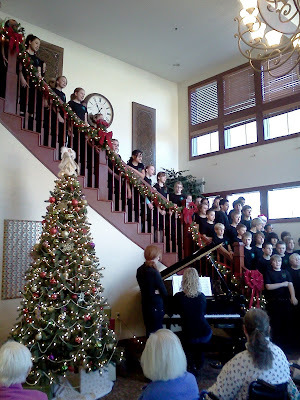 They were kind enough to open their doors to not only their children, but their classmates as well and give them an attentive and appreciative audience. Our final performance of the day was at another retirement home. This facility is a little more specialized in its care, and in some ways was the best audience of all. The joy that children's voices can bring is astounding. And humbling. This photo only captures about half the kids. Like at the first home, we had children on the stairs and a small section of balcony above. I must mention that very special woman in red on the right. I have had the pleasure of two children going through her program and working side by side with her for almost four years now. Kris Engstrom believes in hard work and dedication. From her students and herself. And boy does it show! From the bottom of my heart, Thank You my friend. May you each be blessed in the company you surround yourself with. I know I am.